top pilots who flew with JG54 - The Green Hearts. Each print is also signed by artist Robert Taylor and individually hand-numbered. to give a total of TEN signatures in this edition. one of the most illustrious Geschwader to fly with the Luftwaffe during World War II. Exclusively crafted with a delicate and sympathetic beauty, each of these original works of art is signed by Erwin Leykauf, the highly respected Adjutant of III./JG54 and IV./JG54, together with the artist. 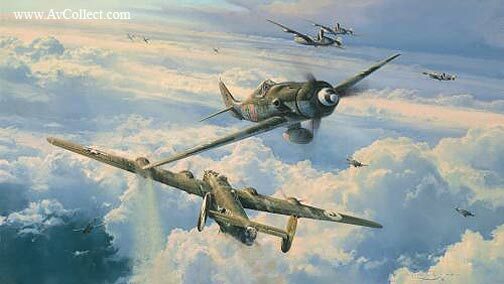 Each original drawing is conservation matted to the highest standards to include the ORIGINAL and genuine signatures of two of the most outstanding and highly respected Luftwaffe commanders of World War II - Walter Nowotny, Kommandeur of I./JG54 and Hannes Trautloft, Kommodore of JG54. These leading figures from JG54 amassed between them a total of 348 victories. Issued with a personally numbered copy of SAVAGE SKIES, this THIRTEEN signature Tribute Edition, limited to just ten copies, is perhaps the most exclusive edition ever to be released by The Military Gallery.